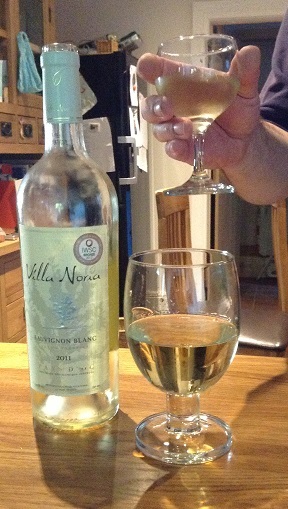 talkhealth > Blog > 2013/06 > Dairy free wine from Villa Noria – tested! Dairy free wine from Villa Noria – tested! In my quest to find wine that is free from too many chemicals and fining agents, free from dairy and low in sulphites I came across a little independent company called Uva Wines (thanks to my friend Chris, who knows the owner). They sell lots of different wine but in particular they have sourced Villa Noria which is freefrom any nasty additives, fining agents and also very low in sulphites to boot. Concerning the rules of sulphite in wines in the European Community, the table below compares Villa Noria with standard wines and other organic wines. You can see from this chart that this wine has less than 50% the amount of sulphite that even other organic wines contain. I was shocked at the tiny difference between sulphite levels allowed in normal and organic wine – it’s not much different really is it? But Villa Noria have slashed that amount. If they can do it, why can’t other wine makers? The beauty of this wine is that Elin at Uva Wines was able to put me in touch with Fabien, the maker of this wine to get confirmation of what ingredients and sulphite levels it had. So, Chris, Mr What Allergy and I tried out this wine on a lovely summer’s evening (not quite warm enough for patio drinking) and we all gave it a definite thumbs up. It was a medium white which is slightly sweeter than mine and Chris’s normal choice but it was really fruity and grew on me as I drank it. A very tasty wine. We all agreed we’d be happy to drink this in a pub or restaurant and really enjoyed it. I have bought wines from many online companies in the past but a recent poll asking them the same question proves that they have absolutely no idea what I’m asking for. Some of them do sell organic wines but they don’t know what’s in them and they can’t actually speak to the wine maker, like Elin can. So top marks to Uva wines and special thanks to Elin and Fabien for indulging a wine loving extreme allergiac who is missing her favourite tipple. It is currently game of Russian Roulette for me until wine labels are updated. So far very few manufaturers list allergens although some are doing so, espcecially The Co-operative Group and Echo Falls. Thanks to you for your honesty – I don’t think many people will even notice the allergen listing on the label but it does give those of us with debilitating allergies the peace of mind and assurance we need. Because it may not contain enough of the allergen to make us ill but it will guarantee a night of red faced flushing at best and days of painful skin irritation at worst. Not much fun I can assure you. This wine from Villa Noria was delicious and passed the waiting till the morning allergic reaction test. No red face, no swollen eyes, no itchy sore skin on my face at all, just a lovely warm glow and another empty bottle for the recycling. Special thanks Uva wines for donating a free bottle for us to taste. Chris and I will now be sharing the purchase of a crate in the very near future.